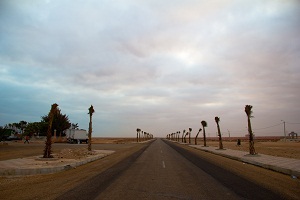 “How are you going to get across no man’s land?” A British overlander questioned me with mild concern in her voice as we talked about our plans while waiting to get our visas for Mauritania in Rabat. The truth is that I rarely have a clue how I’ll get from point A to point B. I generally make it all up on the fly. I have more fun that way, and it gives an air of challenge to my life. But I can’t help but wonder if perhaps I’m too used to travelling in the ease of Latin America where there are regular buses to everywhere and there are few places that sound as obsolete as “no man’s land”. I’m travelling from Morocco to Mauritania, a route that is quite popular with overlanders who have the luxury of driving their own vehicles. Me, well, I try to do everything with public transport. I like the opportunity to travel like the locals, and with the locals, even if it quite often means squeezing myself into an uncofortable seat between a goat and a chicken coop. As the time comes to make the crossing, I can’t help but worry. Between Dakhla, Morocco and Nouadhibou, Mauritania there are but a few human settlements. The region is essentially an occupied territory, and the road along the border is littered with unexploded landmines. I am heading to a country, in Mauritania, that I know nothing about other than that slavery is still commonly practiced and that the Dakar rally was cancelled in Africa due to terrorist threats in the country. When the time comes, I find myself standing on the street leading out of Dakhla waving like a gringo at any car that passes, asking if they are heading to Mauritania. I asked the hotel in town to find a car for me, but the next morning when the vehicle was meant to arrive at 7am, it didn’t show. I’ll have to find a ride on my own. Eventually, a police officer manages to make a couple of calls and finds me a ride in a beat up Mercedes Benz. My travel companions all greet me in French, and within minutes we are all best friends. Crossing through the desert, chasing camel caravans across the highway, the Senegalese woman in the front seat lights a fire to a gas stove and starts brewing tea as we drive. We all laugh as I partly joke about this completely being unsafe. As the cup of tea is passed to me I say shukran. Then bravely I wander into Wolof and say gingerbread, or something along those lines, as the vehicle erupts in laughter at my horrendous attempt at the word meaning thank you. Within an hour, I have been offered a place to stay in Dakar, and have shared breakfast with my Senegalese car mates and our Mauritanian driver. I’m learning quickly about the hospitality of the people south of Morocco. These people are warm, welcoming, and they want nothing more than to share what they have with you. A far cry from the often rough treatment foreigners get in Morocco. We eventually arrive at the border, a dusty outpost scattered with a combination of military vehicles, semi-trucks and garbage. The processing goes smoothly and we make our way across no man’s land, a strip of earth covered in car wrecks, rubbish, and pretty much anything else that could be unwanted. Goats peck away at the ground and a nomad wanders through the rubish. We drive off road for a second, and the driver lets us know that there are no landmines on this particular path, he has driven it once before. “A little bit different than Canada isn’t it?” Says the woman in the front seat in a shade of colourful and choppy English. The car again erupts in laughter, and will maintain its jovial form until I say goodbye in Nouadhibou. Just had an experience like this trying to get out of Ouagadougou. All the locals travel on bikes or donkeys and the only cars are beat up Benzs. Ended up having to charter a car from Ouaga to the Ghanaian border. Beautiful road though! “What am I getting myself into?” is a healthy phrase for a traveler! Enjoyed this post, hope you have a good time on the rest of your trip!